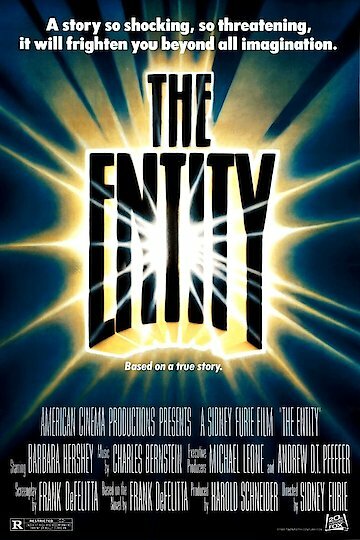 The movie, 'The Entity' is a horror film, that dates back to an occurrence that is supposed to have taken place in the late 70's. It is based on true information, of a young woman and her family being tormented by paranormal occurrences. This movie was originally scheduled to be released in 1981, but was not seen by audiences until late 1982, and the United States was not able to view it until early 1983. A movie of a rare form at this time, it is primarily about an unseen entity that terrorizes a young woman. This movie was based on a budget of nearly nine million dollars, filmed in the United States in English and had a running time of 125 minutes. The main characters are Barbara Hershey, who plays Carla, the young woman attacked by the paranormal entity, and Ron Silver, who plays the other leading role in the movie. He plays Dr. Sneiderman, a psychiatrist. This movie begins when this young woman, a single mother, is in her own home when she becomes violently raped, by what appears to be nothing. She figures she is probably just having a horrible nightmare. She is still concerned, so she takes her children and goes to a friends house. The following day, her car, out of the blue, loses control, and she almost gets killed. This has become so strange and serious, her friend suggests she go see someone, perhaps a Psychiatrist. Carla agrees to go through therapy. It is here that Dr. Sneiderman learns Carla has had a very traumatic childhood, filled with a lot of sexual abuse. When going to see the doctor, Carla is filled with bruises and other injuries. The doctor comes to the conclusion, because of her past, Carla is suffering some form of delirious experience, and she is doing this to herself. Dr. Sneiderman recommends Carla check into a Psychiatric Hospital, she becomes offended and refuses. The entity shows itself in front of Carla's friend, boyfriend, and her son. Because these events are so unbelievable, Carla loses her boyfriend, and experiences a lash out from her son. Dr. Sneiderman is still convinced this is all in Carla's head. Carla is very desperate to understand this, she participates in an attempt to outsmart this, 'thing', where she is almost killed. The next day the entity is back at her house, where she leaves the house with her family, not to return there ever again!